The crew at Sea & Reef have a new clownfish that they are showing off today, and it’s a bit different from the usual offering of captive bred Amphiprions. Instead of sporting some insane splotch or broken pattern, these new clowns keep all of the normal striping in place, but they are simply broader. The Wide Bar Mocha Gladiator clown, as they are being called, sport a dark brownish orange hue that is masked with huge white bars. The middle bar is what really stands out, but even the head and tail bars are much wider than normal too. It is a really beautiful fish, and it is certainly refreshing to see one that somewhat resembles a more natural look. The fish are being released to stores nationwide starting today, so expect to see them at your local shop in no time. The Wide Bar Mocha Gladiator Clownfish is a new Sea & Reef signature designer clownfish. It is developed from the Wide Bar Gladiator Ocellaris Clownfish, which has much wider white bars than a regular Ocellaris Clownfish. In fact the white bars are about twice as wide compared to that of a regular ocellaris (or Maine Mocha) clownfish. 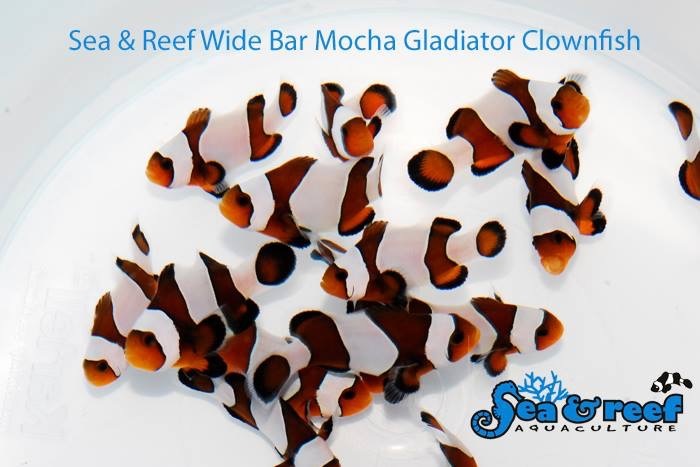 We created our Wide Bar Mocha Gladiator Clownfish by breeding Wide Bar Gladiator Ocellaris Clownfish with our super black Darwin Ocellaris Clownfish. This is the first step in producing a Wide Bar Clownfish with darker coloration. We expect to produce an all-black and white version of this Wide Bar designer clownfish in the future. The original Wide Bar Gladiator Ocellaris Clownfish was first bred by legendary fish breeder Bill Addison, owner of C-Quest hatchery, who created and named this designer clownfish. The production of Wide Bar Gladiator Ocellaris by C-Quest stopped in 2010 when the hatchery closed. 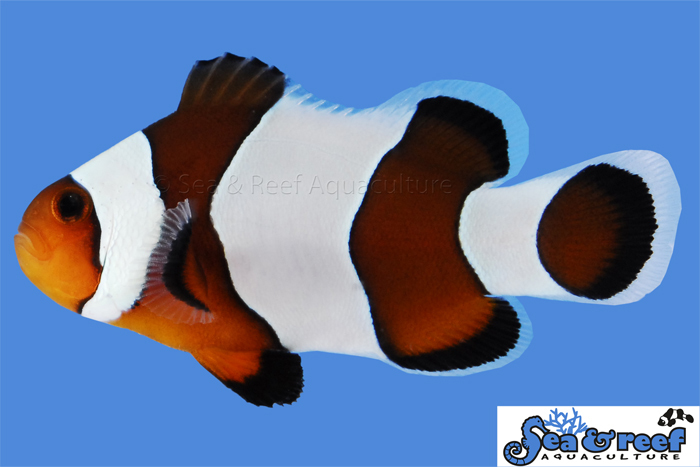 Sea & Reef acquired some of the original Wide Bar Gladiator Ocellaris Clownfish stock and in February of 2014 we brought this beautiful designer clownfish back. We are proud to continue the development of this designer clownfish by giving you the Wide Bar Mocha Gladiator Clownfish.